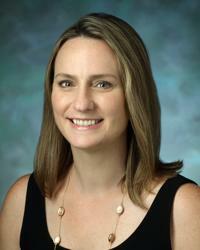 Andrea Goergen, MHS, RDN, LD, is a clinical bariatric dietitian at MedStar Washington Hospital Center. As part of the Bariatric Surgery Program, Andrea works with individuals who are interested in getting bariatric surgery by assessing their dietary needs and helping them receive clearance for weight loss procedures. In order to prepare her patients for surgery, she works with them one-on-one and in small groups to promote the development of healthy habits and prepare them for the necessary dietary changes before and after the procedure. Additionally, she works with patients who have undergone emergency surgery of the gastrointestinal tract, leaving them with an anatomy similar to that achieved with bariatric surgery, and therefore possibly require dietary changes. Her methods focus on mindfulness approaches and how these can help people change lifestyle behaviors, including eating for the improvement of their health. With support, each individual has the power to make positive changes in their lives. Andrea received her Bachelor of Science in Dietetics from the University of Maryland and completed a Master of Health Science in International Health with a concentration on Social and Behavioral Interventions from Johns Hopkins University. She has also completed a dietetic internship with a concentration on leadership and professional development with the Virginia Tech Internship in Nutrition and Dietetics Program. In addition to her training, Andrea has a strong research background. Prior to joining MedStar Washington Hospital Center, she served as the Social and Behavioral Research Branch Project Manager for the National Institutes of Health’s National Human Genome Research Institute for six years. During her time with the NHGRI, she managed research initiatives relating to health education, risk assessment, and disease prevention in addition to presenting research findings at NHGRI and other national conferences. Andrea is also Owner and Nutrition Expert at Cultivate Healthy, a company she founded with the goal of helping individuals obtain optimal health through personalized nutrition counseling and health coaching. She has worked with and continues to work with individuals, small groups, and companies to improve their health and well-being in addition to working with online and television media outlets, such as Women’s Health and Good Morning Washington, to provide nutrition expertise. Fuelled by her passion for education, she has participated in multiple medical mission trips around the globe, including two years as a Public Health Extension Volunteer in Guatemala with the Peace Corps. In addition to English, Andrea is fluent in Spanish. “Most individuals, including those who fall within a normal BMI range, struggle with making healthy food choices, and dietitians are no exception. I consider myself an “all foods fit” dietitian. I truly believe that moderation is the key and that the ability to assess one’s own behavior and decision making throughout the health process is what will help people reach their health goals. My job as a clinical dietitian is to facilitate that understanding as well as the implementation of positive lifestyle behavior changes.